Successfully Added Huadoo HG06 Rugged Smartphone - IP68, 5 Inch HD Display, 2 IMEI, 4G, NFC, OTG, Quad-Core CPU, 2GB RAM, 3600mAh Battery (Black) to your Shopping Cart. No matter how tough life gets, the Huadoo HG06 rugged smartphone can handle whatever you throw at it. Being fully rugged this Chinese smartphone holds an IP68 waterproof rating and is protected against serious bumps and impacts. Its extremely durable design makes this Android phone the perfect device for all of us who love their adventurous outdoor lifestyle yet, at the same time, want to stay connected to friends and family back at home. Featuring a powerful Quad-Core CPU that has been clocked at 1.3GHz, along with 2GB of RAM the Huadoo HG06 rugged smartphone is not only tough from the outside but can also run the most demanding software effortlessly. Its Mali T720 GPU additionally lets you run the latest HD movies and most demanding of mobile games that can be enjoyed to the most on the phone’s 5 inch HD display. With 16GB of internal memory and up to 32GB of external memory this Android smartphone offers you plenty of storage space for all your media and apps, ensuring that next time you go out you can bring along hours worth of fun and entertainment. 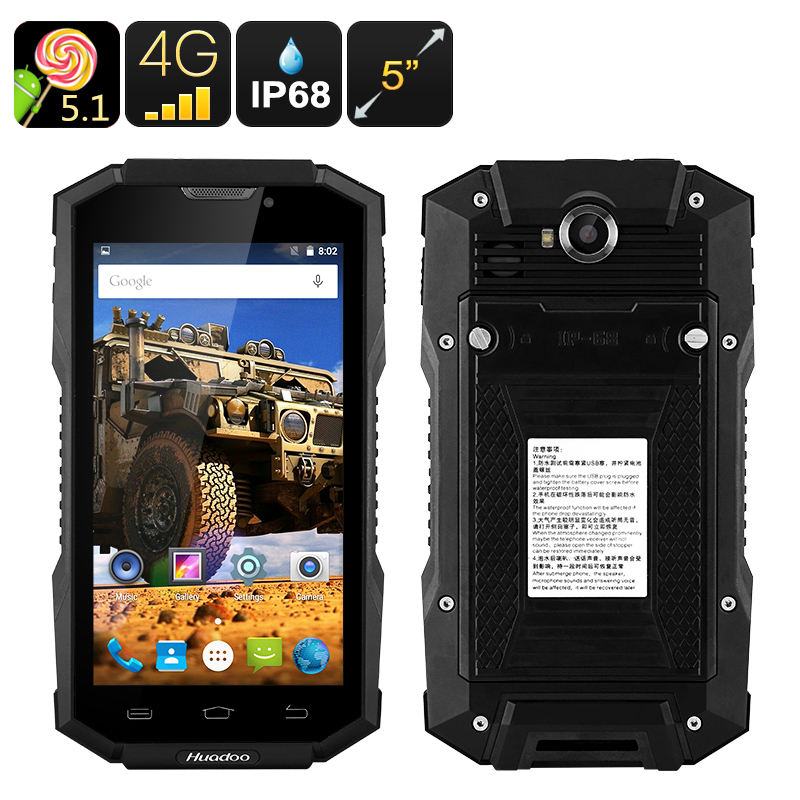 Running on an Android operating system the Huadoo HG06 rugged smartphone lets you enjoy a fast and smooth user experience. Its NFC feature allows you to wirelessly and instantly transfer files with other devices. Additionally, OTG lets you take the most out of your mobile experience by allowing you to connect external hardware devices such as memory pens to your smartphone. With its two IMEI numbers this rugged phone lets you connect to two SIMs and mobile network providers simultaneously. Next time you go on vacation why not throw in a local SIM card and no longer will there be the worry of being unable to connect to the local internet. With its Dual-IMEI numbers and 4G connectivity you can be ensured that, no matter where you’re headed, you will always be connected to the outside world.